Dr. Meg R. Gerstenblith, M.D. 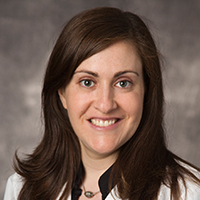 Dr. Meg R. Gerstenblith is a Clinical Assistant Professor in the Department of Dermatology at Case Western Reserve University and a Clinical Associate in the Department of Dermatology at Johns Hopkins University School of Medicine. Dr. Gerstenblith completed her medical degree and Dermatology residency from the Johns Hopkins University School of Medicine. Her expertise was enhanced with a Fellowship in the Division of Cancer Epidemiology and Genetics at the National Cancer Institute, National Institutes of Health. Dr. Gerstenblith is a fellow of the American Academy of Dermatology, and her clinical and research interests include melanoma and pigmented lesions and the genetic epidemiology of skin cancer. Your ticket for the: Dr. Meg R. Gerstenblith, M.D.